At Vrooman Mansion, you will love the beautiful and historic ambiance of a bygone era – a time where silver tea and garden parties, candlelight suppers, and fashionable soirees were the order of the day. We host many public affairs during the year. 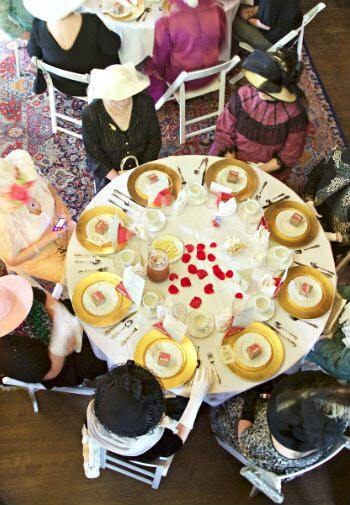 From Downton Abbey themed fashion shows, Steampunk brunches, Titanic 9-course dinners, Gone with the Wind and other themed afternoon teas, A Day in Historic Dimmitt’s Grove, to Holiday Christmas tours, these experiences give visitors a special look into the Mansion and Central Illinois. For all of the above events, ticket sales are limited and on sale a couple months prior to the event. Please check our Facebook page for details. Sign up for our newsletter (signup is in the footer at the bottom of the page) to be notified of upcoming events – you won’t want to miss them! 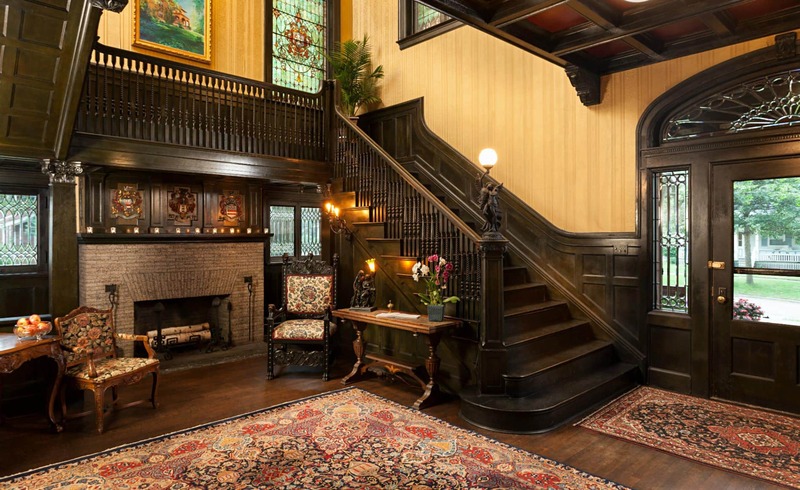 The Vrooman Mansion is a perfect stop for your group or bus tour to relive the past. Tour the house, learn about its rich history, and enjoy a sit-down lunch. Want additional history and entertainment? The Tea Ladies offer a variety of programs; one is bound to enrich your enjoyment for the afternoon! UPCOMING EVENTS – be sure to follow us on Facebook for further updates on events. “Wine Not” come to Vrooman Mansion’s Wine for Windows Wine Tasting Evening? Join us Thursday, April 25, 5:30 pm-7:30 pm. With light appetizers provided by Baxter’s Grille, Wine Tasting, and a cash bar, there is sure to be something for everyone. Tickets are $40 per person and can be purchased by clicking ticket link. Profits from the evening go towards our goal of restoring the Grand Staircase twin stained glass windows. Be sure to follow our Facebook page for updates. For more information, call 309-828-8816. Experience the excitement of the early years of the Kentucky Derby! The first ten years of the derby are covered by The Tea Ladies, from 1875 through 1884. Learn about the horses and jockeys, race day traditions, mint juleps, the coveted rose garland, and, of course, those fabulous hats. The audience participates by reading the exhilarating finish of each race! Great fun for everyone. A fabulous tea buffet will be served with sweets and savories, teas and more! Please wear your hats, as there will be a prize for the best Derby hat. For more information, view our Facebook page. Tickets are $36 per person in advance- call 309-827-2200 today to reserve! Vrooman Mansion did a FANTASIC job!! The tour tea refreshments were beautiful and all the staff incredibly courteous, even handling the last minute changes and vague timing. I couldn’t have asked for more and look forward to working with then again next year on the Cogs & Corsets annual Steampunk Happening.